Amazon.com description: Product Description: George Berkeley (1685-1753), Bishop of Cloyne, was an Irish philosopher and divine who pursued a number of grand causes, contributing to the fields of economics, mathematics, political theory and theology. He pioneered the theory of 'immaterialism', and his work ranges over many philosophical issues that remain of interest today. 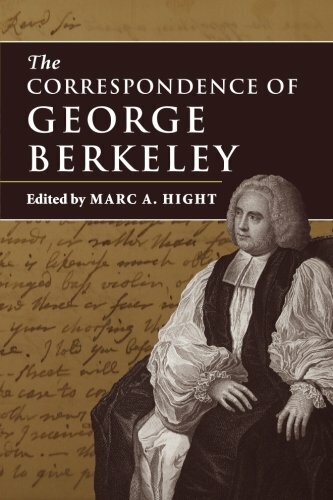 This volume offers a complete and accurate edition of Berkeley's extant correspondence, including letters both written by him and to him, supplemented by extensive explanatory and critical notes. Alexander Pope famously said 'To Berkeley every virtue under heaven', and a careful reading of the letters reveals a figure worthy of admiration, sheds new light on his personal and intellectual life and provides insight into the broad historical and philosophical currents of his time. The volume will be an invaluable resource for philosophers, modern historians and those interested in Anglo-Irish culture. About: George Berkeley (1685-1753), Bishop of Cloyne, was an Irish philosopher and divine who pursued a number of grand causes, contributing to the fields of economics, mathematics, political theory and theology.